Lieutenant Colonel Shai Siman-Tov, commander of Golani’s 12th Battalion who was wounded during Protective Edge, talks about his injuries and recovery. War, trauma and the long road to recovery – Lieutenant Colonel Shai Siman-Tov is familiar with it all but refused to be called a hero in a recent interview with Halochem, the Zahal Disabled Veterans Organization newsletter. It’s been one year since Operation Protective Edge when the commander of Golani Brigade’s 12th Battalion was wounded in combat and sent to hospital for recovery. 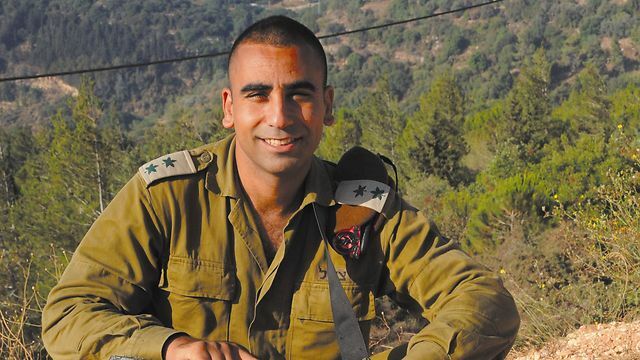 “My battalion’s mission was to track down attack tunnels,” Siman-Tov said in an interview conducted in his room at Tel Hashomer Hospital, his home these past 12 months. “One of them was the tunnel that led to Nahal Oz, and that’s the tunnel we were uncovering when I was wounded. Siman-Tov remembers his life-changing moment on that July 24th night almost entirely. “I remember the moment of injury,” he recounted. “I remember the pace of fire and the tanks firing around me. I don’t remember the moment when a concrete beam fell on me. Siman-Tov struggled with his new reality. “The initial feeling of being in intensive care was one of waste,” he said. “I thought about my soldiers fighting and me being here. The feelings of frustration, or helplessness, came later. I didn’t understand the full meaning of the injury. I was sure it was a matter of a few weeks or maybe a few months, and I’d be back in the battalion. Come join us in honoring all of our heroes at our 45th Anniversary Gala on November 15.